Construction of an 11½ mile double deck bridge and causeway starting at Grant Park, then over Lake Michigan from Oak Street to Dempster Street in Evanston, Illinois, for automobile and monorail traffic was proposed by Mark D. Kalischer, architect and engineer. 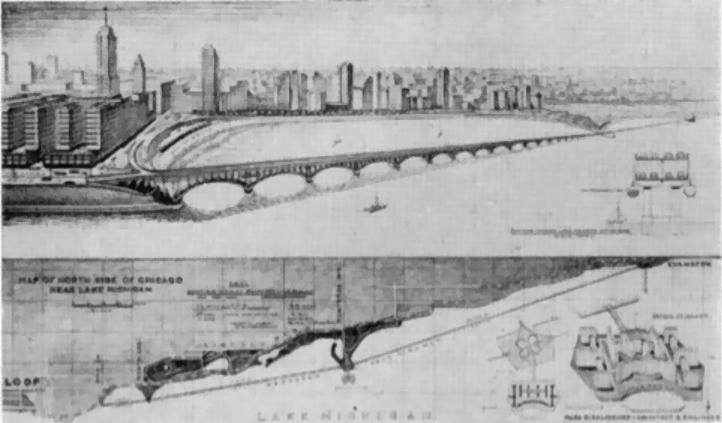 Proposed 11½ mile double deck bridge and causeway by architect Mark D. Kalischer. Kalischer said the project would cost approximately 175 million dollars ($1,593,427,960 today) but would permit autos to travel from Grant Park in Chicago to Dempster Street in about ten minutes. 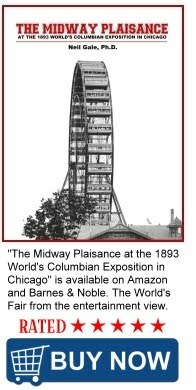 Kalischer said that monorail cars, automatically operated, could provide even faster service at 80 to 85 miles per hour from a Grant Park terminal in eight minutes allowing for one stop at Montrose Avenue in Chicago and then on to Evanston. The second phase of the multi-purpose lake highway would also be built southward towards Indiana. The architect said the double decking would permit the lower four lane highway could be used as a bomb shelter. Kalischer proposed 100 foot bridge spans approximately 28 feet over the waterline.